What does it mean to foster a retired racing greyhound for Pocono Greyhound Adoption? A: When you foster a greyhound for us, you are agreeing to let your foster greyhound stay with you until he or she gets picked by his/her forever family. A: Foster homes are needed because our group does not have a kennel facility. The number of greyhounds we can help find their forever homes after they retire, depends on how many open foster homes we have at a given time. During this fostering period, a retired racer will learn the ropes of retirement, going from professional athlete to professional couch potato. A: To become an approved foster for Pocono Greyhound Adoption, fill out the foster application and send it in. A group representative will review it, check the references you provide, and will go over any questions or concerns you may have about fostering. We will provide food and any medications your foster greyhound will need, so there is no financial burden on your part! A: As mentioned above, fostering for us means letting a greyhound crash with you until his or her forever family is found. During this time, you’ll help a retired racer learn all sorts of things. Remember, they are all new to living in a home environment! Since they are crate-trained at the track, you should have a crate available for your foster to use. We can provide you with a foster crate if you do not already have one. Many greyhounds consider their crate a “safe zone” of sorts and will retreat to it on their own. Housebreaking a greyhound is usually pretty easy and they learn fairly quickly that the house is not their turnout pen. They’ve been on their kennel routine up until this point and keeping a regular schedule of sorts (meal times, potty outings, etc.) for your foster greyhound is one of the best ways to help them successfully transition to life in a home as a pet. Other “new” things you may have to teach your foster greyhound about may include other breeds of dogs, cats, children, glass doors/windows, and stairs. Stairs can sometimes be the trickiest of the new things your foster will encounter. Our board members and volunteers are always there for support if you need some tips on how to help your foster adjust. Greyhounds are very adaptable, they just need your patience while they adjust to retirement. During this fostering period, you’ll also be able to see the greyhound’s personality come out. This is important because it will help us determine what kind of forever home would be a perfect match for your foster! 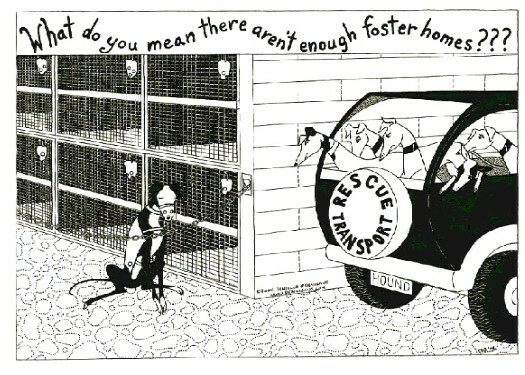 A: The length of each foster’s stay will vary. Some greyhounds get picked right away while others take a bit longer to find their forever family. Rest assured, if something comes up on your part and you are no longer able to foster the greyhound, we will work quickly to move the greyhound into a new foster home. right click and "print target, or save target as"
Are your pets spayed or neutered? ____If no, explain why? Are they current on their vaccinations? ___ If no, explain why? mobile home / condo / duplex ? 8. Since Greyhounds are sighthounds rather than scenthounds, Greyhounds must be kept on leash at all times when not within a securely fenced area. 11. Please list two personal references (not family members) and their telephone numbers. the foster greyhound to meet and greets as needed. Pocono Greyhound immediately for further instructions. from the veterinary clinic at a specified time. group, at all times while the foster greyhound is in my possession. I also agree to return the foster greyhound upon request. occur as a result of my providing housing for this foster greyhound.